After months of drafting, designing, discussing and adapting, we are happy to finally announce that we have launched a brand-new website. Re-designing our website took us through an emotional rollercoaster starting from the excitement that turns into frustration and finally ends up at joy. We have decided to share the re-designing process with you, so let us start from the beginning. In 2014, we re-designed our website and after three years, it was about time to rethink and reflect on how it could be improved. Trends have changed and so has the weight of which what elements are more important. The foundation of our new website rests on a Wagtail CMS, an open-source Django content management system, customized by our own development team. Building a CMS specifically to our site allows us to constantly renew our website over time by using a healthier methodology than that of traditional web design. We went to a talk from Luke Summerfield in Aarhus, Denmark, who pinned the concept of growth-driven design, which is a new approach to website design. As times change, so do Plecto. We have been fortunate enough to work with amazing partners that allows us to grow both as a team and as a business. With an aspiration for continuous improvement, we have adopted the principles behind growth-driven design for our website. Fundamentally, growth-driven design is an iterative approach in which continuous learning and incremental improvements are highlighted. The approach succeeds in designing the website from the viewpoint of the visitor supported with a validated pattern of behavior on the site. On top of increasing focus on how the website is actually used, the methodology flourishes by allowing marketing departments to simultaneously improve the website along with other marketing activities, which is an obvious contrast to traditional web design where you on average dedicate 108 days to a redesign. While the headline oversimplifies the process, growth-driven design actually occurs in just three steps or stages. You will learn that the process highly resembles to the agile approaches known from entrepreneurship. Every web design process starts by setting a goal for the website. Ask yourself, what is the desired action that I wish my visitors to complete? In our case, we wish to increase the number of free trials. Once you have set your goal, work on a strategy to support your goal. Consider points like how visitors are accessing your site, why they are visiting it, and what value perception they receive when visiting it. A Launch Pad website is much like a minimum viable product on steroids. It is a quickly built website that reflects your strategy and supports your underlying goal. Anyone who has ever worked on a website redesign knows that there is no such thing as a “quickly built website”. Unless, of course, you simply buy a WordPress template. 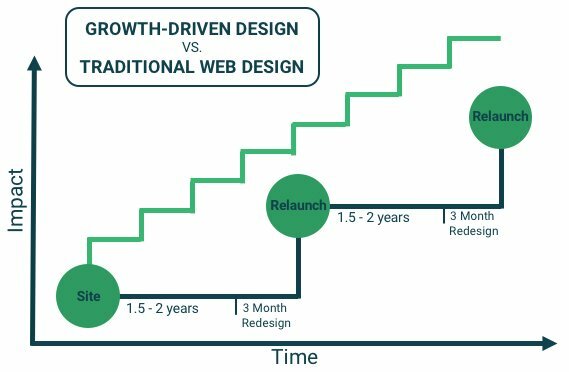 In growth-driven design, a launch pad website has a build period of 2-3 months whereas it is 3-6 months using traditional website design methods. Once you have your launch pad website running, you will commence on a yearlong iterative development process revolving around improvement and validation. The iterative process is purposed to help you achieve the desired outcome from your visitors. It is a continuous improvement of your website in order to deliver optimal performance. On this stage, you plan monthly sprint cycles by comparing your website’s performance against your initial goal for the redesign. Prioritize what is most impactful and start from the top. Afterwards, you develop and build your plans in collaboration with relevant teams and departments in your organization. It is important that you drive traffic to your new page so that you are able to extract learning about your audience’s behavior and make data-driven optimizations. The learnings are what will help you decide whether the change was beneficial or if it needs another iteration. Eventually, growth-driven design will become a cross-department collaboration that generates customer insights for departments across your organization. With our website relaunch, we have built a launch pad website that we will now improve throughout the following months. Among the things to come, you can expect an increasing number of interactive dashboard elements that will automatically visualize the dashboard features unique to Plecto. So, stay tuned and revisit from time to time!